This 185-mile loop follows quiet dirt roads and two-tracks through woodlands and grasslands among 800+ extinct volcanoes of all sizes, from small cinder cones to the towering San Francisco Peaks in northern Arizona. Optional side trips include fire lookouts, cinder cone summits, and Lava River Cave. This loop also serves as a northern extension to the popular Coconino Loop to create a longer, incredible experience. Perfect for bikepackers looking to get off the beaten path while following dirt roads and two-tracks, the San Francisco Volcanic Field Loop meanders through northern Arizona’s San Francisco Volcanic Field. 800+ volcanoes that erupted over the past few million years dot the landscape - some are a few hundred feet tall, and some tower many thousands of feet above the surrounding countryside. From Flagstaff, the route heads west toward Bill Williams Mountain on dirt roads and jeep tracks, passing through sprawling parks and ponderosa pine forests. Beyond Williams, the route enters deserted, dry pinon-juniper woodlands and then high grasslands of the Babbitt Ranches. You’ll pass eerily dark, yawning cinder cones before climbing into the young, cindery landscape of Sunset Crater National Monument. Sunset Crater is the youngest volcano in the area, having erupted just 1,000 years ago. The tallest peaks in Arizona, the San Francisco Peaks, are the final feature you’ll experience, climbing high into aspen forests at over 9,000 feet and then descending a hugely scenic water pipeline service road that’s closed to motorized use back toward Flagstaff. This is a stellar ~3-day route with numerous options for side exploration and minimal technical riding in countryside rarely visited. But water is scarce, so plan accordingly. Ideal time of year (and potentially weather conditions): Late spring, early fall. The route is rideable May-October, but the summer months will be warm and monsoon storms in July and August should be avoided. You NEED an Arizona State Land Department Recreation Permit. The northern part of the route passes through land owned by Babbitt Ranches. Public access and camping is permitted - simply respect their land and stock. Water sources on this route are limited and include many stock tanks that are most reliable in late Spring and late Summer. Waypoints for these are provided with labels like “poor” (unreliable, likely silty) and “good” (more reliable, cleaner water). DO NOT plan that every stock tank will have water, and carry more water than you expect to need. Water from some stock tanks is often silty and will clog water filters and is not amenable to UV water treatments. Carry a means of chemical water treatment like Aqua Mira or iodine. The Craters and Cinder Cones Loop was developed by Kurt Refsnider to create a northern extension to the popular 250-mile Coconino Loop (developed by Scott Morris and Chad Brown) and to share with bikepackers one of Kurt’s favorite Arizona landscapes. This 60-mile segment climbs west out of Flagstaff on old two-track across Observatory Mesa before meandering in and out of grassy parks and through ponderosa pine forests. Farther west, the route passes Lava River Cave, traverses Spring Valley, climbs over the east shoulder of Sitgreaves Mountain, and then crosses Interstate 40. The final miles pass Dog Lake Reservoir and Bill Williams Mountain before dropping quickly into the touristy Route 66 town of Williams. Riding is mostly on dirt forest roads with some short sections of rougher two-track. Stay at the U.S. Forest Service Spring Valley Cabin Bunkhouse below Sitgreaves Mountain (mile 31). Reservations required; call the Kaibab N.F. (928-635-8200) for information. There are no resupply options on this segment until Williams. Williams offers restaurants, a grocery store, and motels. The northern part of the route passes through land owned by Babbitt Ranches. Public access and camping is permitted - simply respect their land and stock and abide by Leave No Trace ethics. At the farthest northeastern corner of the loop is SP Crater, a striking cinder cone that’s worth a hike to the top for a stellar view into the crater itself. Approach using the obvious steep trail on the southwest side of the cone and then scrambling to the top. Plan for ~90 minutes round trip at least for this side hike. After circling around SP Crater, you’ll begin climbing back toward the San Francisco Peaks, passing the yawning Colton Crater along the way. The route then turns east around O’Leary Peak and onto loose cinder trails that link into the back entrance of Sunset Crater National Monument. These cinder trails are usually packed enough from ATV traffic, but they’re slow going for ~4.5 miles as you experience the otherworldly landscape and views of the 1,000-year-old Sunset Crater. Recommended printed topographic maps: Trails Illustrated maps 856 (Flagstaff/Sedona) and 854 (Sycamore Canyon/Verde Valley) provides nearly complete coverage. The impressive SP Crater, the San Francisco Peaks’ Inner Basin, and Waterline Road. Like on the first segment of the route, water sources are limited in this dry landscape. The most reliable water sources are (1) a pipe-fed stock tank at mile 44, (2) several pipe-fed stock tanks between miles 51 and 53 (FILL UP HERE! ), (3) Sunset Crater N.M. Visitor’s Center at mile 98, (4) a pond in Lockett Meadow at mile 105, and (5) a piped spring at the high point on the route at mile 98. There are no resupply options on this segment until returning to Flagstaff aside from a gas station 7 miles northeast of Williams. Dispersed camping is permitted in most areas of this segment except for the first ~12 miles northeast of Williams. Sunset Crater N.M. has a small campground near the Visitor’s Center, and there’s another campground in Lockett Meadow just before the high point on the route. You NEED an Arizona State Land Department Recreation Permit for this section of the route. 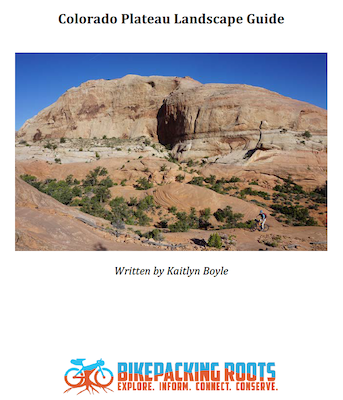 The Colorado Plateau Landscape Guide is a resource for bikepackers to learn about and connect with the places through which they ride - in this case, the broader Colorado Plateau region. The guide serves as an informative resource to educate backcountry travelers about the interconnected landscape layers of the Colorado Plateau. It is designed to offer an overarching understanding of the broader landscape layers, the physical, biological, and anthropological. The Craters and Cinder Cones Loop passes through the Coconino National Forest, the Kaibab National Forest, and Sunset Crater National Monument. The route closely bypasses the Kachina Peaks Wilderness and the Kendrick Mountain Wilderness, both of which provide crucial protected habitat for flora and fauna that contribute to the overall ecosystem health of the San Francisco Volcanic Field. Sunset Crater and Wupatki National Monuments protect and preserve cultural history, artifacts, and sacred sites as well as provide habitat for endemic flora and fauna. The scientific community overwhelmingly agrees that Earth’s climate is changing. Projections for how climate change will impact the Southwest include an increase in mean annual temperature, a decrease in annual precipitation, and an increase in extreme weather events (including strong storms and droughts). Within the San Francisco Volcanic Field – a land of ponderosa pine forests and high grasslands – the implications of a hot and dry future are of concern for the forests and sustainability of livestock grazing. The world’s largest contiguous ponderosa pine forest extends along northern Arizona’s Mogollon Rim from Grand Canyon to New Mexico. In the face of a warming, drying climate in the southwest, extended drought and intensifying fire regimes coupled with the current state of choked forests composed of small trees and an overgrowth of understory pose a threat of devastating wildfire that threaten the future of these forests and the communities that call them home. Proactive forest management focused on strategic thinning and controlled burning to restore forest health and equip the forest to handle pressures of climate change are critical actions to preserving the future of the ponderosa pine forest. The Four Forest Restoration Initiative is a landscape-scale restoration initiative between multiple National Forests in effort to restore 2.4 million acres of forest over the next 20 years, renovating large-scale forest management in the process. The initiative will support more natural fire regimes, improve the health of the ponderosa pine ecosystems, further supporting its ability to survive in a hotter drier climate, support watersheds, and protect communities and local economies. Average temperatures in the Southwest are anticipated to increase by 2 to 6 °F by mid-21st Century. The resulting ever-intensifying periods of drought will add pressure to livestock grazing in the Southwest. As temperatures continue to increase, water sources will become more limited, cattle will be under greater stress, and grasses will grow more slowly. Livestock management will need to adapt to the pressures of this climate change. The Craters and Cinder Cones Loop passes over both public and private land. The private land is owned by a conservation-oriented ranching family, Babbitt Ranches, LLC, the largest private landowner in Arizona. Babbitt Ranches, founded in 1886, recognizes the importance of sustainable ranching and land management on the Coconino Plateau region. The Landsward Institute is a partnership between Babbitt Ranches and Northern Arizona University that exists to support the ecosystems, habitats, and sustainable rangelands of the Coconino Plateau region and Little Colorado River Valley and conducts and supports related research.